Jessica Estrada is a business coach who helps women turn their passion into a chic online business using a mix of mindset work and business strategy. In this post, she’s sharing her top five tips for growing your blog and business using the magic of Pinterest. As a business coach, I see so many bloggers and business babes trying to get more views to their site and grow their audience by using social media platforms like Instagram and Facebook, which are great. But, if you’re only using those two channels to drive traffic to your website, you’re really missing out. Pinterest is so often ignored by bloggers and business owners. It's is not just for pinning hundreds of pretty photos of outfit inspiration, recipes, dream homes, and beachy vacays; it’s an incredible marketing tool that can help drive tons of traffic to your blog and business quickly and easily. In this post, I’m sharing with you my top 5 tips that you need to start implementing ASAP in order to start slaying on Pinterest. These exact steps are what helped me reach two million monthly viewers on Pinterest (which is wild!) in just a few short months after launching my business. The first thing you need to do in order to use Pinterest as a marketing tool is to shift your perspective and start pinning for your ideal clients, customers, or readers instead of for yourself. Every single board you have and every single pin you pin should be there for the purpose of attracting your ideal reader. Put yourself in his or her shoes and think of what type of content they would really love to read and pin only those things. Everything else you can keep on a secret board. Having success on Pinterest actually begins with having really good quality content on your blog. Make sure ever blog post you create delivers values for your ideal clients or customers. Having pretty pictures is not enough. Share tips, tells stories, or create tutorials. You want your readers to walk away with something. If you create amazing content, people will keep coming back for more. If your blog or business doesn’t already have an email list, get on it—like right now. An email list is essential for every blog and business. Unlike with social media platforms, your email list isn’t subject to algorithm changes. You own and have full control over your email list and can reach out to your followers whenever you want. The easiest way to get people to join your email list is by enticing them with a lead magnet, which is a really awesome free piece of content. A lead magnet can be created in various formats. It can be a PDF workbook, video training, a tutorial, or an audio file. It’s up to you. Feel free to get creative. The goal of the lead magnet is to deliver value that your readers want and is in alignment with the products or services your business sells. Think of your lead magnet as an appetizer and your paid offer as the main course. A common misconception about Pinterest is that it’s just another social media platform, but that’s actually not the case. Pinterest is a search engine just like Google. So in order to drive more traffic to your blog and business using Pinterest, you need to implement SEO strategies; namely, keywords. Make sure you’re writing relevant keywords and even hashtags on every single one of your pin descriptions. This helps make your content searchable, and makes it super easy for more people to find your cool content. Pro Tip: Make sure you activate rich pins. This will add even more details to each of your pins which will help them rank higher in search results. Pinterest loves it when you pin consistently and considers you a top pinner when you do so. Pinning 15-25 pins every day is a good goal. Don’t let that scare you. It’s actually really easy to pin that much content quickly using a scheduling tool such as Tailwind. You can batch schedule a week’s worth of pins in just a few minutes. Easy peasy. Want to learn more about how to use Pinterest to grow your blog and business? Visit jessicaestrada.net for more free resources. 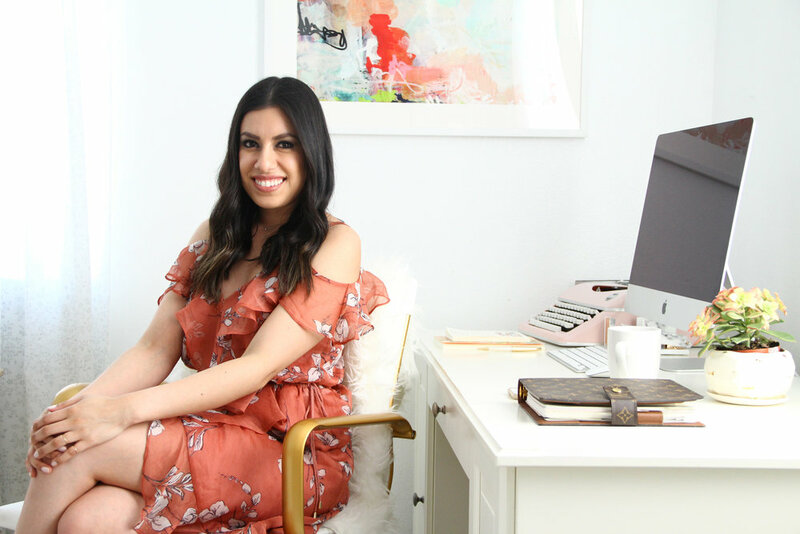 Jessica Estrada is a former fashion editor turned business coach based in sunny Los Angeles. With her flagship Passion to Paycheck coaching program, Jessica helps aspiring girlbosses turn their passion into a bombshell brand and online business so they can get paid to do what they love, make the impact they know they were born to make, and create freedom in their lives.